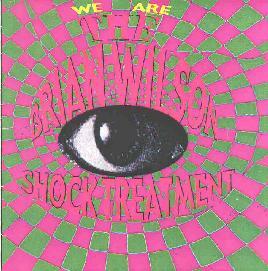 The Brian Wilson Shock Treatment - "We Are"
The band are at their best on fiery, thrashing and deliciously psychedelic garage rockers like "Brain On Fire", "The Shiny Porpoise" and "Colin Powell Ferguson". I really dig those warbling efx'd vocals on "Brain On Fire", which go so nicely with the pounding air assault bass, crashing guitars and winding trip licks. The stoned, marching, science fiction psychedelia of "Death Star 5" is hard to resist. And "Headless And Happy" demonstrates how the Shock Treatment can thrash your brain and lovingly lull you in the same song. In summary, The Brian Wilson Shock Treatment are yet another gold notch on the wall for the folks at Slutfish. If you like your psychedelia raw and played with a mischievous sneer leering behind that flower power smile, then check these guys out.